The index though opened flat to positive but saw profit booking with each passing hour to close near the lows of the day at 7896.25, loss of 32.70 points. The broader market though was negative, with 732 advances to 810 declines. The range for Expiry is at 7800-8000. Call option 7900-8000 added huge 22.62 lacs OI whereas profit booking was seen at 8100 and above strike prices. 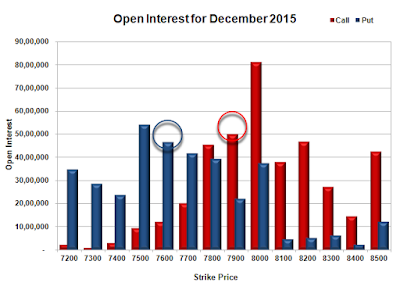 Put option 7850 added huge 10.90 lacs OI whereas short covering was seen at 7900 and above strike prices. Nifty Open Interest is at 1,01,55,600 down by 25,34,850, whereas Jan series added 28.14 lacs with decrease in price, 100% roll-over with small short build-up. Bank Nifty Open Interest is at 11,99,550 down by 2,41,980, whereas Jan series added 2.60 lacs with decrease in price, 100% roll-over with short build-up. FII’s bought 1.39 lacs Futures, which includes net 17541 contracts long build-up and 11986 contracts short build-up, with increase in net OI by 29527 contracts, includes 58443 longs to 52888 shorts for the day. FII’s Index future open contract as on date is 163866 Longs to 179364 Shorts, Net (-)15498 up by 5555 contracts. 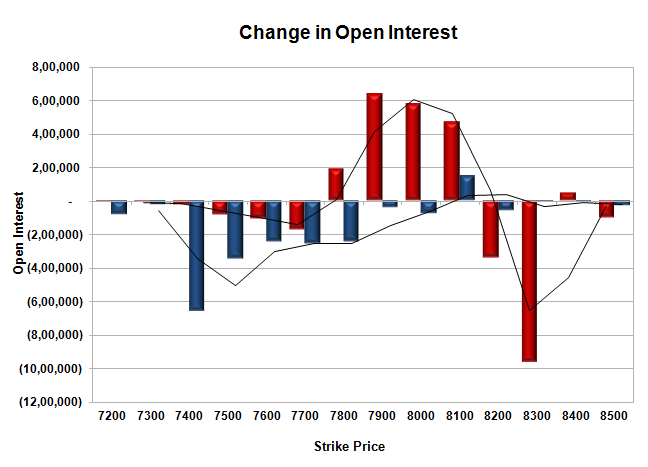 Initial support at 7850, with OI of 33.79 lacs and below that at 7800 with OI of 44.97 lacs. Initial resistance at 7950, with OI of 35.56 lacs and above that at 8000 with OI of 86.49 lacs. 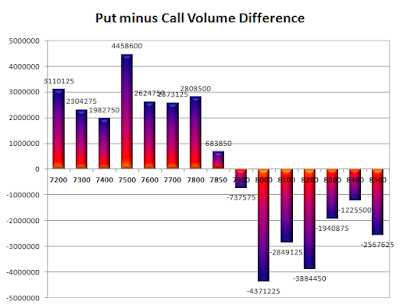 Day Range as per Option Table is 7851 - 7962 and as per VIX is 7837 - 7956 with 7910 as the Pivot. The index opened flat and stayed in a narrow range for the first few hours only to dip towards 7900 which was bought with ease and Nifty closed at 7928.95, small gain of 3.80 points. The broader market though was negative, with 650 advances to 916 declines. The range for series stays at 7500-8000. 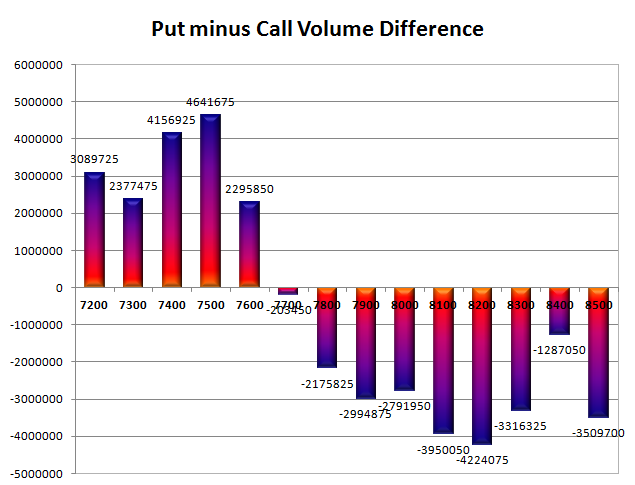 Call option 8000 added 4.12 lacs OI whereas short covering was seen at 7900 and below strike prices. Put option 7950-7850 added 14.95 lacs OI whereas profit booking was seen at 7800 and below strike prices. Nifty Open Interest is at 1,26,90,450 down by 24,07,650, whereas Jan series added 44.32 lacs with increase in price, 100% roll-over with huge long build-up. Bank Nifty Open Interest is at 14,41,530 down by 2,82,660, whereas Jan series added 5.75 lacs with increase in price, 100% roll-over with long build-up. FII’s bought 3.21 lacs Futures, which includes net 33108 contracts long build-up and 20263 contracts short build-up, with increase in net OI by 53371 contracts, includes 152468 longs to 139623 shorts for the day. FII’s Index future open contract as on date is 146325 Longs to 167378 Shorts, Net (-)21053 up by 12845 contracts. 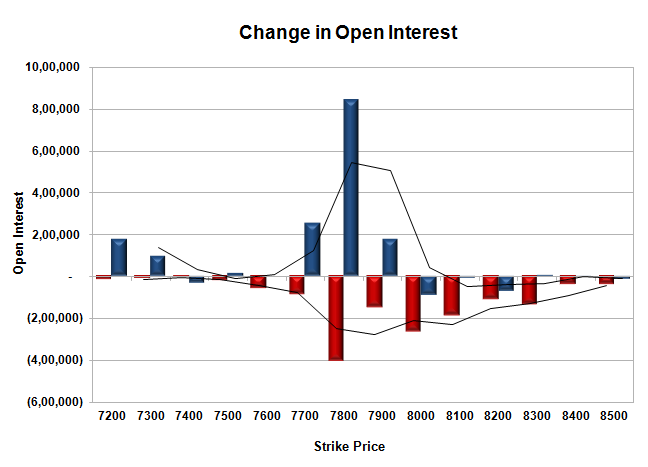 Initial support at 7900, with OI of 43.43 lacs and below that at 7800 with OI of 49.88 lacs. Initial and best resistance at 8000, with highest OI of 81.23 lacs and above that at 8100 with OI of 30.96 lacs. 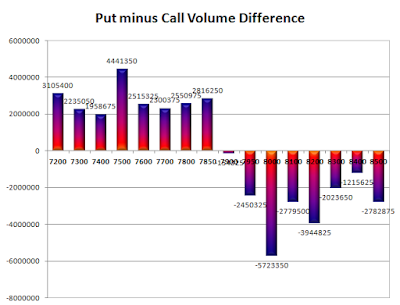 Day Range as per Option Table is 7868 - 7984 and as per VIX is 7869 - 7989 with 7925 as the Pivot. The index opened flat but saw buying interest from the morning itself to move above 7900 and closed at 7925.15, gain of 64.10 points. The broader market was positive, with 875 advances to 677 declines. The range for series stays at 7500-8000. Call option 8000 added 2.04 lacs OI whereas short covering was seen at 7900 and below strike prices. Put option 7900-7800 added 23.50 lacs OI whereas profit booking was seen at 7700 and below strike prices. Nifty Open Interest is at 1,50,98,100 down by 13,02,750, whereas Jan series added 29.73 lacs with increase in price, 100% roll-over with huge long build-up. Bank Nifty Open Interest is at 17,24,190 down by 84,510, whereas Jan series added 1.15 lacs with increase in price, 100% roll-over with long build-up. 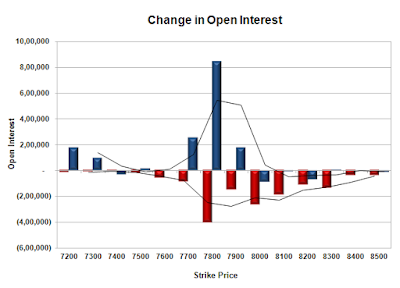 FII’s sold 0.28 lacs Futures, which includes net 3027 contracts long build-up and 4136 contracts short build-up, with increase in net OI by 7163 contracts, includes 66382 longs to 67491 shorts for the day. FII’s Index future open contract as on date is 113217 Longs to 147115 Shorts, Net (-)33898 down by 1109 contracts. Initial and best support at 7800, with OI of 57.66 lacs and below that at 7700 with OI of 43.00 lacs. 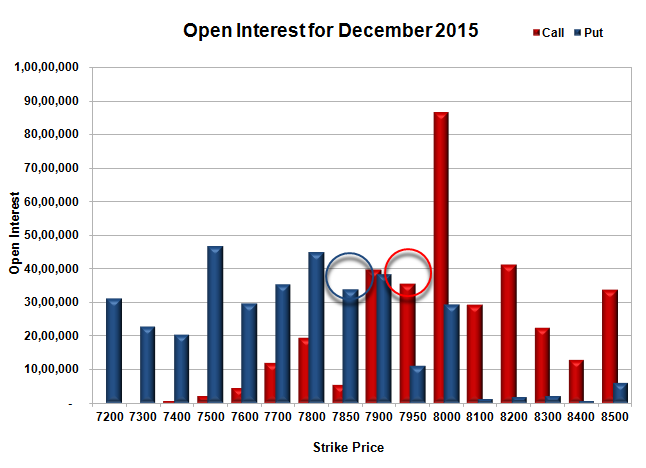 Initial and best resistance at 8000, with highest OI of 77.11 lacs and above that at 8100 with OI of 31.96 lacs. 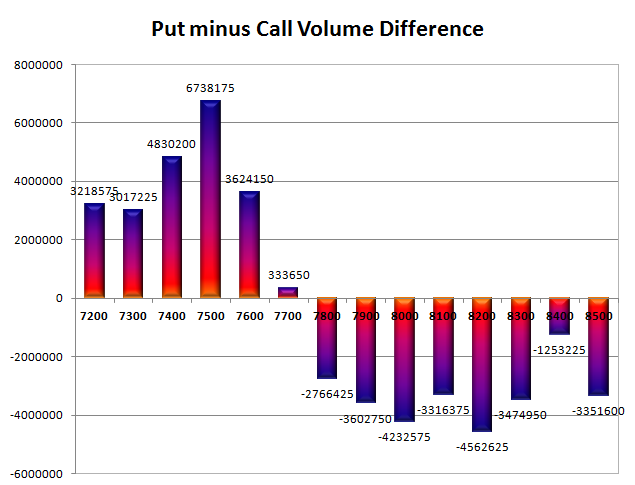 Day Range as per Option Table is 7850 - 7974 and as per VIX is 7865 - 7985 with 7908 as the Pivot. The index opened up at the highs of the day around 7889 but saw profit booking to close flat at 7861.05, small loss of 4.90 points. The broader market was positive, with 875 advances to 655 declines. The range for series stays at 7500-8000. None of the Call option added any OI whereas short covering was seen at 7900 and below strike prices. Put option 7900-7800 added 0.95 lacs OI with profit booking seen at 7700 and below strike prices. 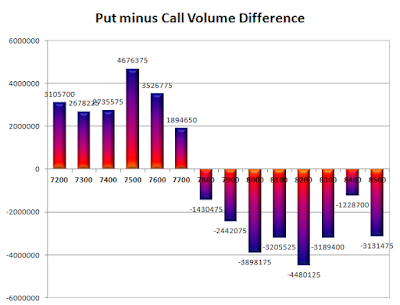 Nifty Open Interest is at 1,64,00,850 down by 7,15,125, whereas Jan series added 6.25 lacs with no change, mostly roll-over with small short covering/long liquidation. Bank Nifty Open Interest is at 18,08,700 down by 76,590, whereas Jan series added 0.62 lacs with decrease in price, mostly roll-over with some long liquidation. FII’s bought 1.52 lacs Futures, which includes net 6129 contracts long build-up and 54 contracts short build-up, with increase in net OI by 6183 contracts, includes 27253 longs to 21178 shorts for the day. FII’s Index future open contract as on date is 110190 Longs to 142979 Shorts, Net (-)32789 up by 6075 contracts. Initial very good support at 7800, with OI of 50.54 lacs and below that at 7700 with OI of 44.52 lacs. 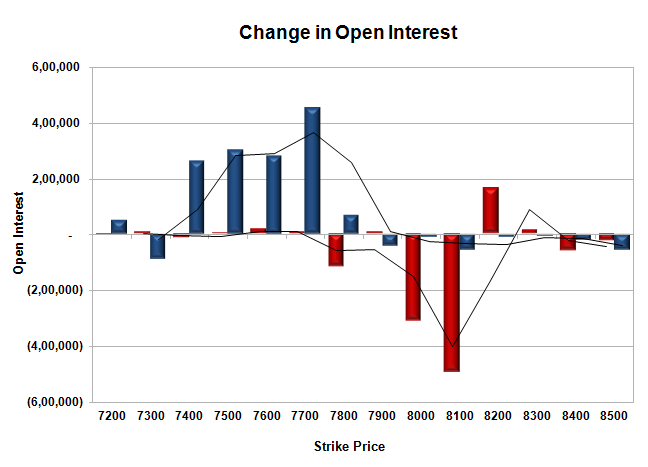 Initial resistance at 7900, with OI of 51.83 lacs and above that at 8000 with highest OI of 75.07 lacs. Day Range as per Option Table is 7800 - 7923 and as per VIX is 7804 - 7918 with 7862 as the Pivot. The index opened up around 7830 and stayed strong throughout the entire session of trade and closed near the highs at 7865.95, huge gain of 79.85 points. The broader market was strong, with 931 advances to 614 declines. The range for series stays at 7500-8000. 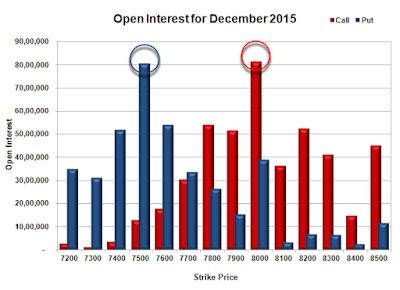 Call option 7900 added 0.93 lacs OI with short covering seen at 7800 and below strike prices. Put option 7900-7700 added huge 22.20 lacs OI with profit booking seen at 7600 and below strike prices. Nifty Open Interest is at 1,71,15,975 down by 13,14,450, whereas Jan series added 12.68 lacs with increase in price, mostly roll-over with small short covering. Bank Nifty Open Interest is at 18,85,290 down by 74,760, whereas Jan series added 0.49 lacs with increase in price, mostly roll-over with some short covering. FII’s bought 2.36 lacs Futures, which includes net 2342 contracts long build-up and 7079 contracts short covering, with decrease in net OI by 4737 contracts, includes 43388 longs to 33967 shorts for the day. FII’s Index future open contract as on date is 104061 Longs to 142925 Shorts, Net (-)38864 up by 9421 contracts. 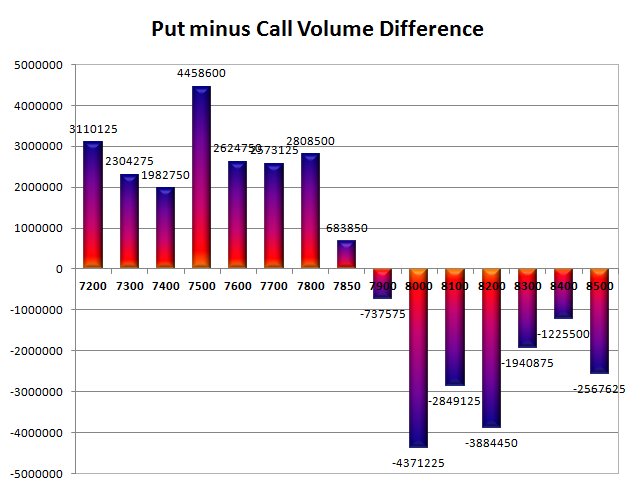 Initial very good support at 7800, with OI of 50.37 lacs and below that at 7700 with OI of 46.61 lacs. Initial resistance at 7900, with OI of 57.05 lacs and above that at 8000 with highest OI of 75.33 lacs. 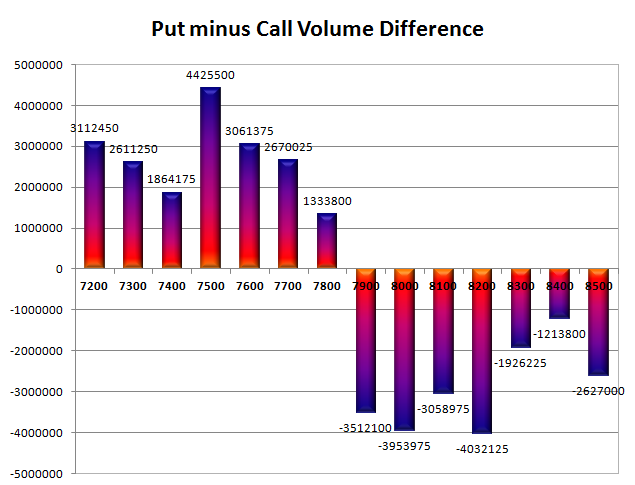 Day Range as per Option Table is 7792 - 7922 and as per VIX is 7810 - 7922 with 7855 as the Pivot. The index opened flat and stayed in a narrow range but saw huge sell-off to close weak near the lows at 7786.10, loss of 48.35 points. The broader market was negative, with 737 advances to 821 declines. The range for series stays at 7500-8000. 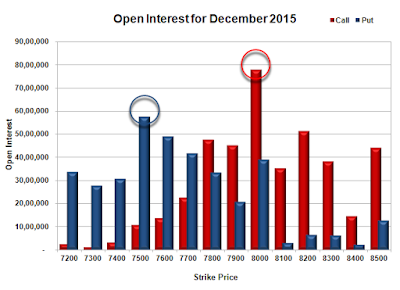 Call option 7700-7900 added huge 11.77 lacs OI with profit booking seen at 8000 and above strike prices. Put option 7700-7600 added 2.55 lacs OI with short covering seen at 7800 and above strike prices. 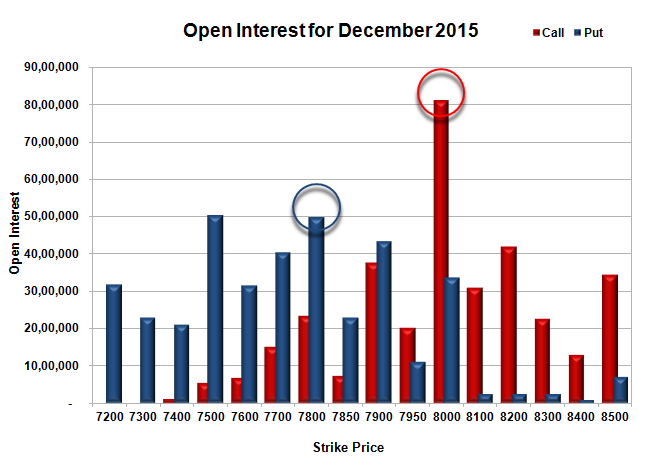 Nifty Open Interest is at 1,84,30,425 down by 1,08,675, with decrease in price, most probably long liquidation. Bank Nifty Open Interest is at 19,60,050 down by 1,24,620, with decrease in price, most probably huge long liquidation. 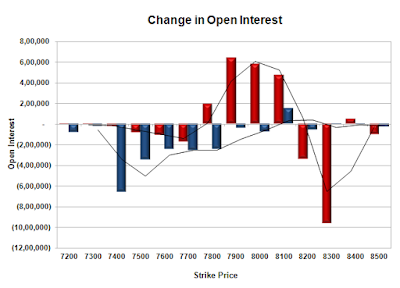 FII’s sold 0.73 lacs Futures, which includes net 1910 contracts long liquidation and 1008 contracts short build-up, with decrease in net OI by 902 contracts, includes 17924 longs to 20842 shorts for the day. FII’s Index future open contract as on date is 101719 Longs to 150004 Shorts, Net (-)48285 down by 2918 contracts. 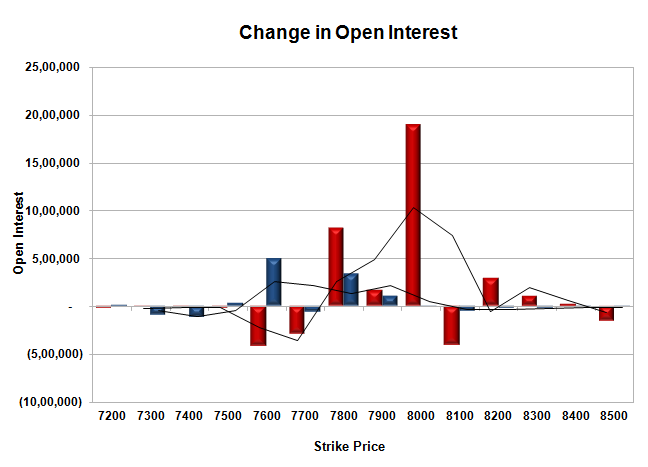 Initial support at 7700, with OI of 42.87 lacs and below that at 7600 with OI of 47.95 lacs. 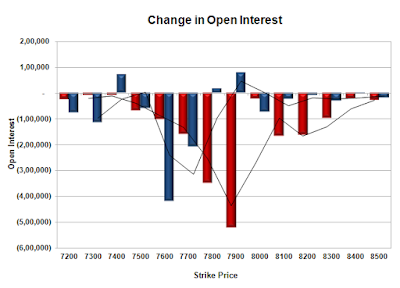 Initial resistance at 7800, with OI of 49.09 lacs and above that at 7900 with OI of 56.12 lacs. 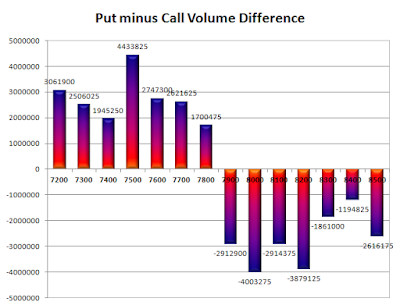 Day Range as per Option Table is 7730 - 7865 and as per VIX is 7727 - 7845 with 7803 as the Pivot. The index opened weak around 7745 but saw buying interest from the morning itself went up with each passing hour to close near the highs at 7834.45, huge gain of 72.50 points. The broader market was strong, with 1113 advances to 454 declines. The range for series has come down to 7500-8000. 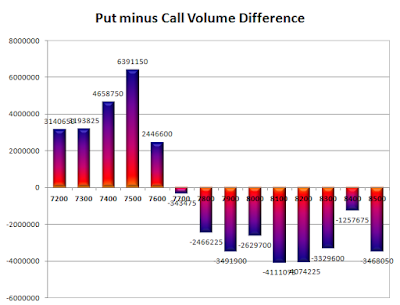 Call option did not any OI whereas profit booking seen at 7900 and above strike prices. Put option 7900-7500 added huge 12.86 lacs OI with profit booking seen at 7400 strike price. Nifty Open Interest is at 1,85,39,100 down by 88,875, with increase in price, most probably short covering. Bank Nifty Open Interest is at 20,84,670 down by 1,20,450, with increase in price, most probably huge short covering. FII’s bought 0.13 lacs Futures, which includes net 1691 contracts long liquidation and 2206 contracts short covering, with decrease in net OI by 3897 contracts, includes 15597 longs to 15082 shorts for the day. FII’s Index future open contract as on date is 103629 Longs to 148996 Shorts, Net (-)45367 up by 515 contracts. 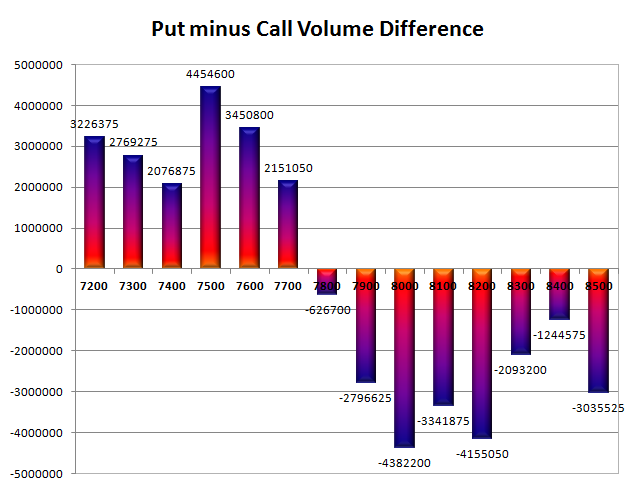 Initial super support at 7700, with OI of 41.66 lacs and below that at 7600 with OI of 46.60 lacs. 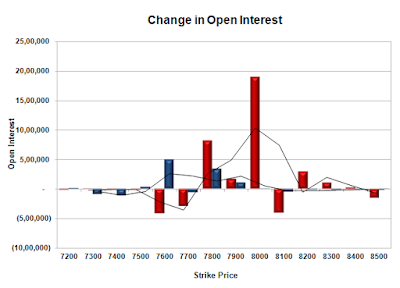 Initial strong resistance at 7900, with OI of 50.12 lacs and above that at 8000 with highest OI of 81.12 lacs. 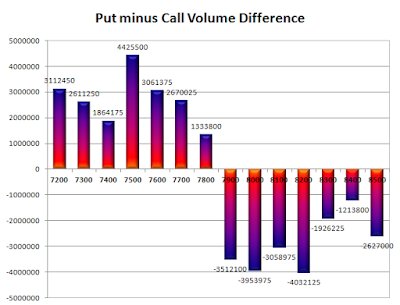 Day Range as per Option Table is 7743 - 7880 and as per VIX is 7776 - 7893 with 7803 as the Pivot. The index opened weak and stayed weak for the entire session of trade closing around the lows of the day at 7761.95, huge loss of 82.40 points. The broader market was negative, with 699 advances to 858 declines. The range for series has come down to 7500-8000. Call option 7800-811 added huge 18.83 lacs OI with profit booking seen at 8200 and above strike prices. Put option 8100 added 1.48 lacs OI with profit booking seen at 7500 and below strike prices. Nifty Open Interest is at 1,86,27,975 down by 4,26,225, with decrease in price, most probably huge long liquidation. Bank Nifty Open Interest is at 22,05,120 down by 64,590, with decrease in price, most probably long liquidation. FII’s bought 1.65 lacs Futures, which includes net 6211 contracts long build-up and 399 contracts short covering, with increase in net OI by 5812 contracts, includes 26245 longs to 19635 shorts for the day. 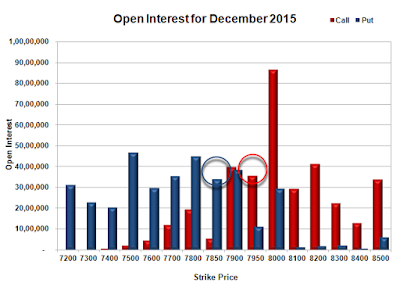 FII’s Index future open contract as on date is 105320 Longs to 151202 Shorts, Net (-)45882 up by 6610 contracts. 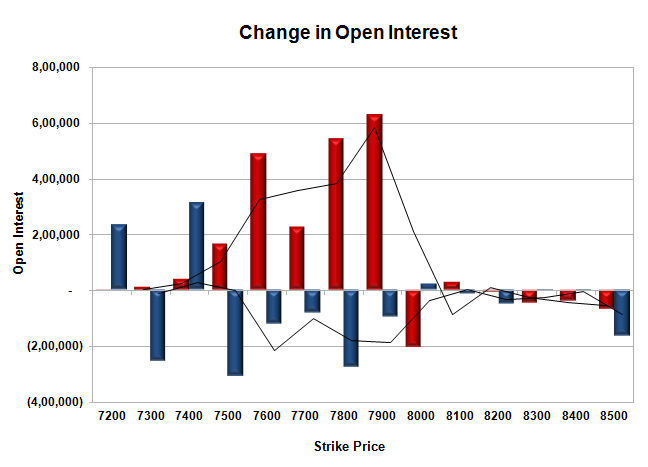 Initial support at 7700, with OI of 39.14 lacs and below that at 7600 with OI of 46.60 lacs. 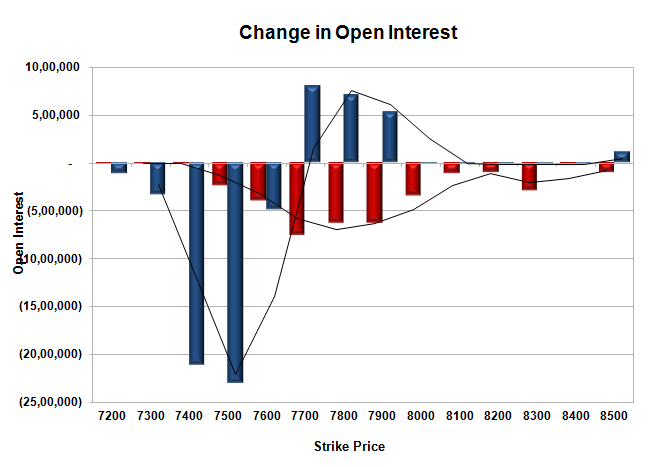 Initial resistance at 7800, with OI of 49.63 lacs and above that at 7900 with OI of 51.63 lacs. Day Range as per Option Table is 7712 - 7845 and as per VIX is 7703 - 7821 with 7784 as the Pivot. The index opened strong around 7783, but saw small profit booking to the lows of the day at 7738, but strong short covering saw the index close near the highs of the day at 7844.35, huge gain of 93.45 points. The broader market was strong, with 1239 advances to 322 declines. The range for series is 7500-8200. Most of the Call option did not add any OI with short covering seen at 7800 and below strike prices. Put option 7900-7700 added huge 20.40 lacs OI with profit booking seen at 7600 and below strike prices. Nifty Open Interest is at 1,90,54,200 down by 4,50,975, with increase in price, most probably huge short covering. Bank Nifty Open Interest is at 22,69,710 down by 1,12,380, with increase in price, most probably huge short covering. FII’s sold 2.43 lacs Futures, which includes net 13397 contracts long liquidation and 3690 contracts short covering, with decrease in net OI by 17087 contracts, includes 26628 longs to 36335 shorts for the day. FII’s Index future open contract as on date is 99109 Longs to 151601 Shorts, Net (-)52492 down by 9707 contracts. 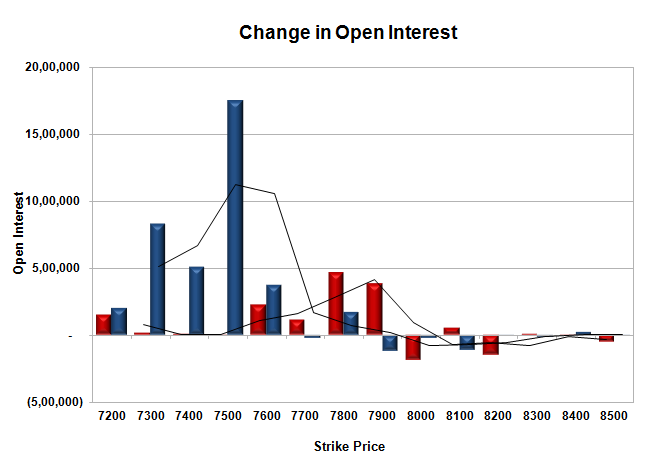 Initial support at 7800, with huge OI addition of 7.07 lacs and below that at 7700 with OI of 41.71 lacs. 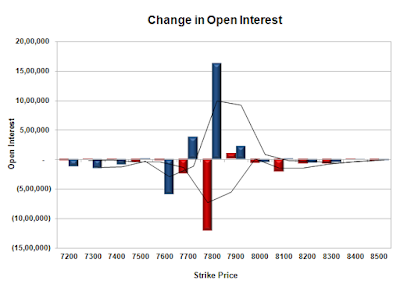 Initial resistance at 7900, with OI of 45.23 lacs and above that at 8000 with highest OI of 77.97 lacs. 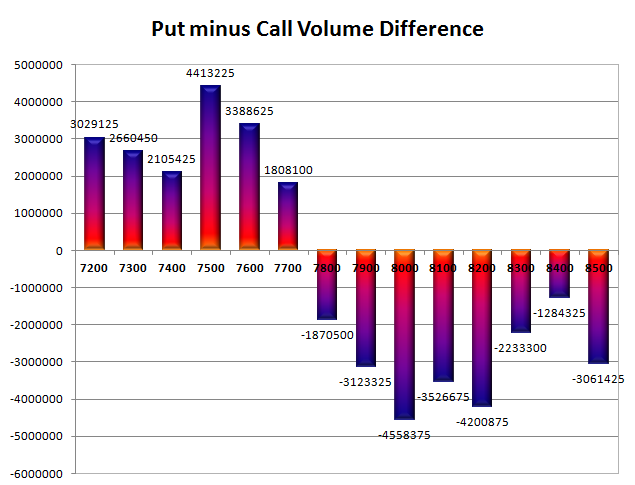 Day Range as per Option Table is 7753 - 7887 and as per VIX is 7786 - 7903 with 7812 as the Pivot. The index opened positive and saw huge short covering rally to end the day near the highs at 7750.90, gain of 50.00 points. The broader market was positive, with 832 advances to 702 declines. The range for series is 7500-8200. Call option 7800-8000, 8200-8300 added huge 32.82 lacs OI with short covering seen at 7700 and below strike prices. Put option 7900-7500 added 9.11 lacs OI with profit booking seen at 7400 and below strike prices. 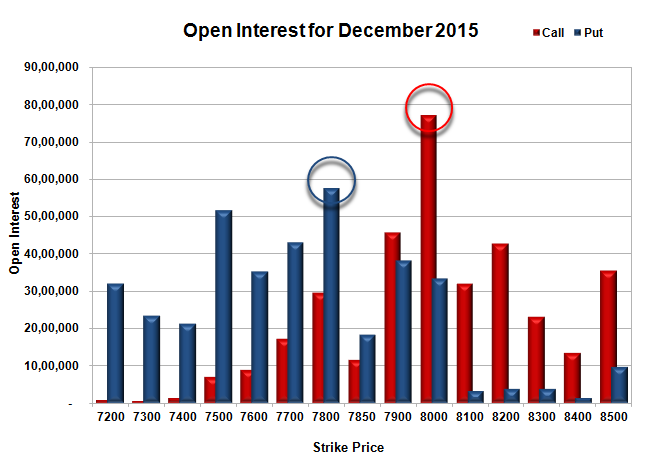 Nifty Open Interest is at 1,95,05,175 down by 7,61,475, with increase in price, most probably huge short covering. 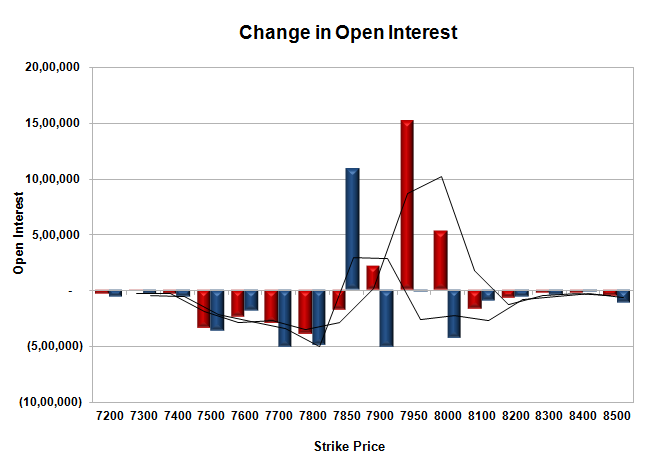 Bank Nifty Open Interest is at 23,82,090 down by 1,83,930, with increase in price, most probably huge short covering. FII’s bought 0.47 lacs Futures, which includes net 4161 contracts long liquidation and 6044 contracts short covering, with decrease in net OI by 10205 contracts, includes 28333 longs to 26450 shorts for the day. FII’s Index future open contract as on date is 112506 Longs to 155291 Shorts, Net (-)42785 up by 1883 contracts. 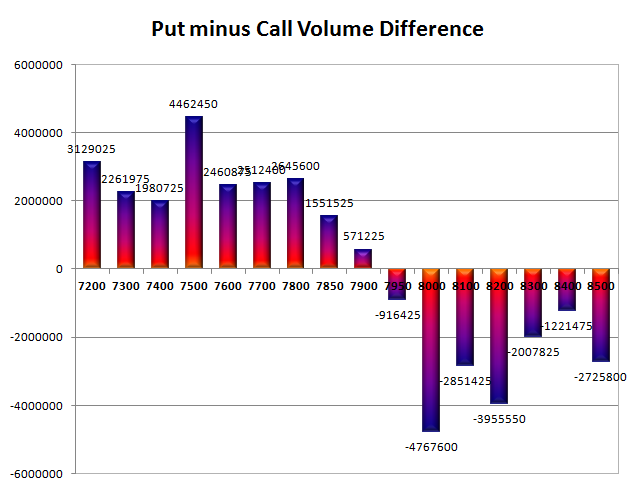 Initial super support at 7700, with OI of 33.66 lacs and below that at 7600 with OI of 54.05 lacs. 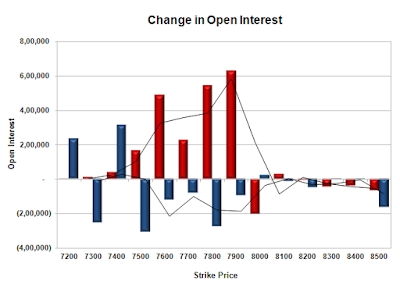 Initial resistance at 7800, with OI of 53.98 lacs and above that at 7900 with OI of 51.57 lacs. Day Range as per Option Table is 7684 - 7812 and as per VIX is 7683 - 7819 with 7748 as the Pivot. The index opened flat and after an initial dip towards 7625, saw the buyers back in action to move the index above 7700 and closed at 7700.90, gain of 50.85 points. The broader market was positive, with 968 advances to 545 declines. The range for series is 7500-8200. Call option 8200-8300 added 1.82 lacs OI with profit booking seen at 8000 and above strike prices. Put option 7800-7400 added huge 13.68 lacs OI with profit booking seen at 7300 strike price. Nifty Open Interest is at 2,02,66,650 up by 4,34,250, with increase in price, most probably huge long build-up. Bank Nifty Open Interest is at 25,66,020 down by 23,760, with increase in price, most probably short covering. 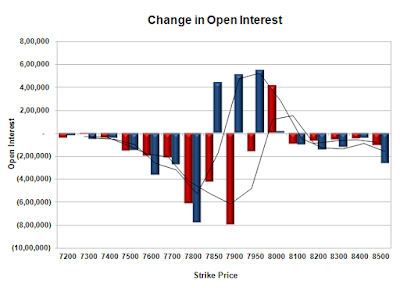 FII’s sold 2.06 lacs Futures, which includes net 6956 contracts long liquidation and 1285 contracts short build-up, with decrease in net OI by 5671 contracts, includes 18821 longs to 27062 shorts for the day. FII’s Index future open contract as on date is 116667 Longs to 161335 Shorts, Net (-)44668 down by 8241 contracts. Initial super support at 7600, with OI of 49.11 lacs and below that at 7500 with highest OI of 80.22 lacs. 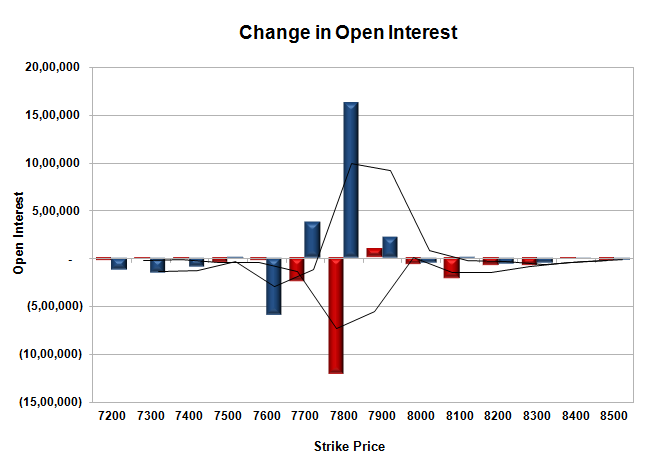 Initial resistance at 7800, with OI of 45.77 lacs and above that at 7900 with OI of 49.90 lacs. Day Range as per Option Table is 7618 - 7749 and as per VIX is 7631 - 7771 with 7677 as the Pivot. The index opened weak around 7558, but saw huge buying interest to scale 7600 with ease and stayed positive to close at 7650.05, gain of 39.60 points. The broader market was positive, with 871 advances to 663 declines. The range for series stays at 7500-8100. 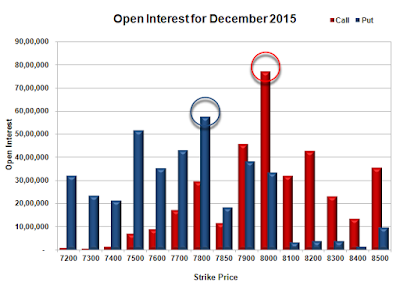 Call option 7200-7900 added huge 13.32 lacs OI with profit booking seen at 8000 and above strike prices. 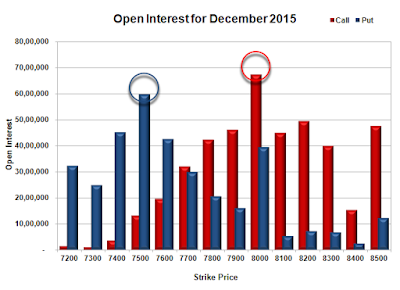 Put option 7600-7200 added huge 36.53 lacs OI with short covering seen at 7900 and above strike prices. Nifty Open Interest is at 1,98,32,400 up by 3,87,600, with increase in price, most probably huge long build-up. Bank Nifty Open Interest is at 25,89,780 down by 54,000, with no change in price, most probably short covering/long liquidation. 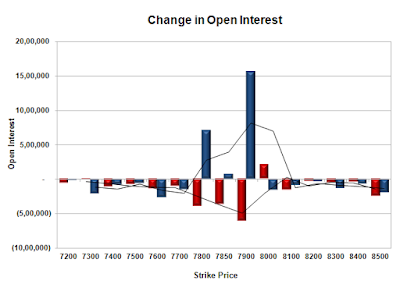 FII’s bought 0.69 lacs Futures, which includes net 8458 contracts long build-up and 5712 contracts short build-up, with increase in net OI by 14170 contracts, includes 28451 longs to 25705 shorts for the day. 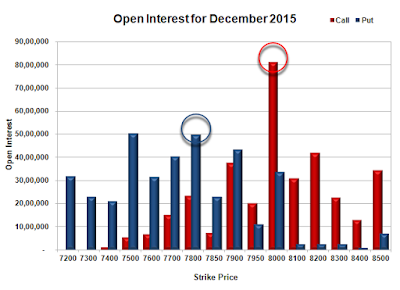 FII’s Index future open contract as on date is 123623 Longs to 160050 Shorts, Net (-)36427 up by 2746 contracts. 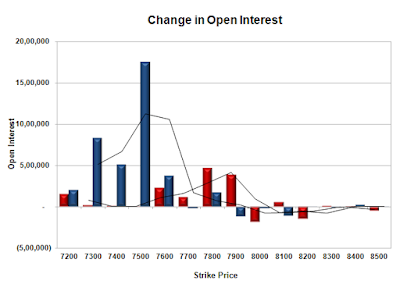 Initial support at 7600, with OI of 46.30 lacs and below that at 7500 with highest OI of 77.21 lacs. 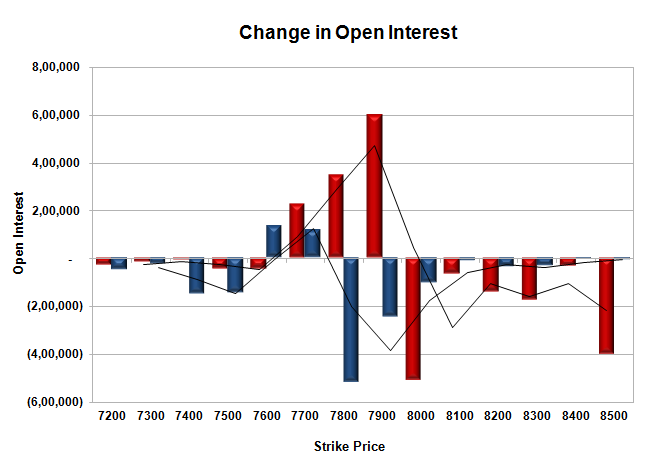 Initial resistance at 7700, with OI of 33.14 lacs and above that at 7800 with OI of 46.95 lacs. Day Range as per Option Table is 7563 - 7696 and as per VIX is 7579 - 7721 with 7622 as the Pivot. The index opened flat to positive but saw huge selling pressure from the onset to dip below 7600 but closed just above at 7610.45, still a huge loss of 72.85 points. The broader market was weak, with 456 advances to 1082 declines. The range for series is back to 7500-8100. 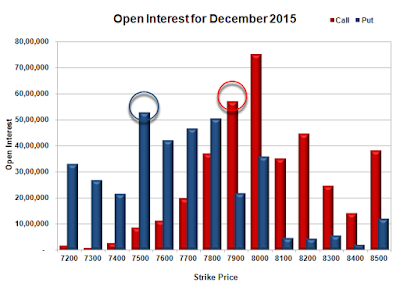 Call option 7500-7900 added huge 20.53 lacs OI with profit booking seen at 8000 and above strike prices. Put option 7200, 7400 added 5.45 lacs OI with short covering seen at 7500 and above strike prices. Nifty Open Interest is at 1,94,44,800 up by 5,79,000, with decrease in price, most probably huge short build-up. Bank Nifty Open Interest is at 26,43,780 up by 1,13,880, with decrease price, most probably huge short build-up. FII’s sold 4.00 lacs Futures, which includes net 8189 contracts long liquidation and 7791 contracts short build-up, with decrease in net OI by 398 contracts, includes 24251 longs to 40231 shorts for the day. FII’s Index future open contract as on date is 115165 Longs to 154338 Shorts, Net (-)39173 down by 15980 contracts. Initial support stays at 7600, with OI of 42.60 lacs and below that at 7500 with OI of 59.72 lacs. 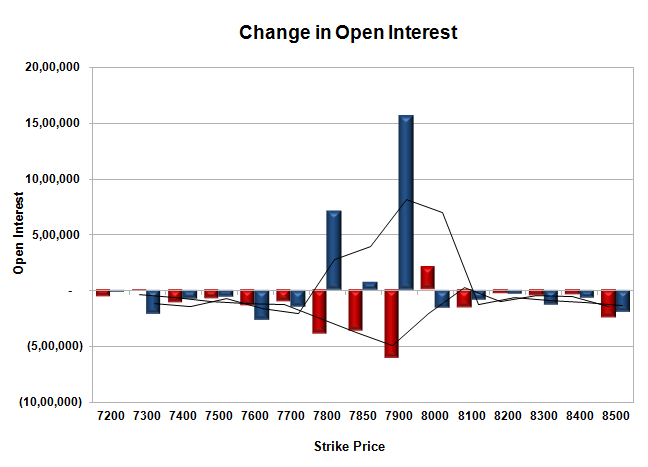 Initial resistance at 7700, with OI of 32.01 lacs and above that at 7800 with OI of 42.35 lacs. Day Range as per Option Table is 7562 - 7689 and as per VIX is 7542 - 7679 with 7630 as the Pivot.